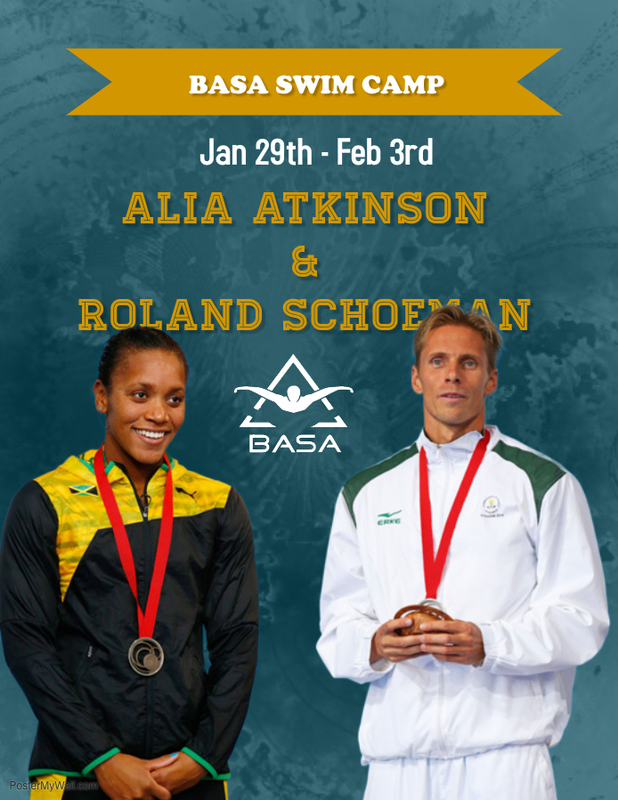 The Bermuda Amateur Swimming Association and it’s member clubs will be hosting week long swim camp with Roland Schoeman, South African Olympian and Alia Atkinson, Jamaican Olympian and current World Record holder. The camp will run from Jan 29th – Feb 3rd and athletes participating will get an exclusive opportunity to be coached by these world ranked swimmers. The age group swimmers participating will get some stroke specific training from two of the best athletes in the world. All clubs will have members participating in the 2019 BASA Swim Camp, which is a positive step forward for Bermuda Swimming. Atkinson will also be hosting a free swim clinic, sponsored by Digicel, open to the public on Saturday Feb 2nd, 2019 from 2-5PM at BASA (Saltus) Pool. This will be a great opportunity for non-BASA registered students to come out and learn the basics of swimming and get inspired by one of the Caribbean’s most decorated athletes. Schoeman earned multiple World Records during his career, and Atkinson currently holds the World Record in 100 SCM Breaststroke. Bermuda Amateur Swimming Association welcomes both of these athletes to the island, and hopes the younger generation will continue to follow their successful careers. The Digicel Alia Atkinson Swim Clinic will also host a meet & greet with Alia for those wanting to speak with, or get an autograph from the World Record holder. The clinic is open to non-BASA registered students, ages 11-18. Any questions about the clinic can be directed at fletcher.bda@gmail.com. Schoeman attended the University of Arizona on scholarship and broke several NCAA Records during his collegiate career. He graduated with degrees in Psychology and Communications. Atkinson attended Texas A&M University in College Station, Texas on scholarship. She holds many Carifta Records, and is one of the most decorated swimmers in Carifta Swimming Championships history. In Doha at the 2014 Short Course World Championships, Atkinson focused on the sprint Breaststroke events — the 50 and 100-meter Breaststroke. After narrowly getting out-touched in the 50m Breaststroke, Atkinson had nothing to lose going in the 100m. Atkinson tied the World Record with a strong back half, and surprised herself in the process. Her World Championship win in the event made her the first black woman in history to win a World Title in swimming, and was Jamaica’s First Gold Swimming Medal in the World Championships.